I new I had to do an interview with her! Here is what she has to say on her decorating style! 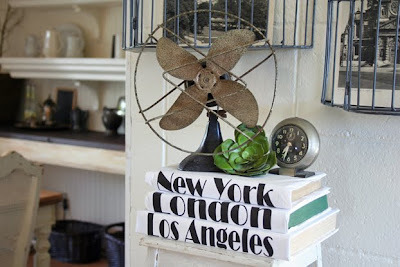 "I would describe my decor as a mix of combined styles that flow together with a common theme. Because of the fairly small size of my home, 1297 square feet, I needed each space to have its own separate identity, yet have a continuous flow throughout each room to tie it all together. " What was the look you were after for your kitchen?
" 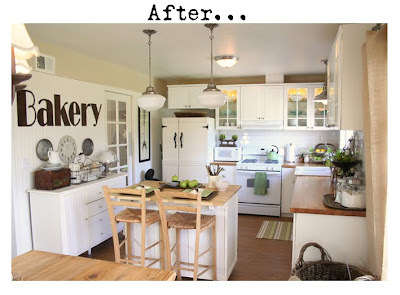 For my kitchen, the look is urban cottage. 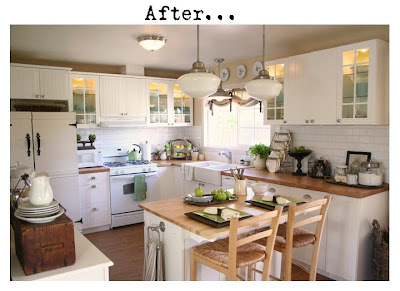 I have industrial lighting over my sink, and vintage style schoolhouse pendants over my island. The white subway tile back splash keeps the look clean and classic, and I went with brushed nickel hardware for all my cabinetry. The stainless steel trash can gives off a great modern vibe, while the "Bakery" letters, done in a vintage deco font and stained in dark walnut have a vintage period feel. 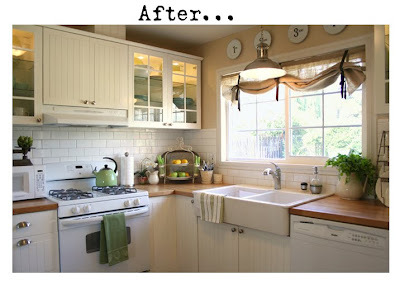 I went with wood butcher block counter tops which lend a warm rustic feel against the cool white cabinetry. The french pained glass and bead board is a continuing theme throughout the house, creating a smooth transition into each space. 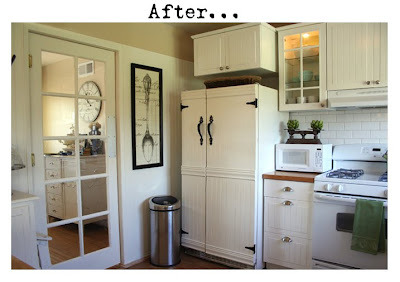 The large farmhouse sink and bead board covered refrigerator help bring in the cottage charm feel." how would you describe your living room style? "My living room is a combination of both french and cottage style, and I feel the look is still evolving. I brought contrast to my furniture by combining dark walnut against creamy white and find the look to be very inviting. The only floral in my living room is my tufted love seat, which will probably go with me to the retirement home someday, as I can't ever imagine parting with that piece. Besides, I can't resist how beautifully it sits against my 8 foot tall walnut stained mirror. 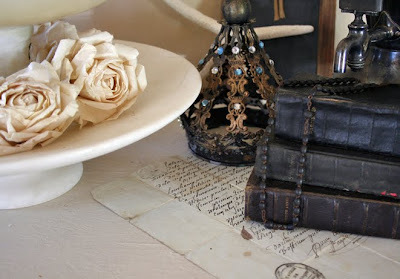 I kept my walls and curtains neutral, for a clean and fresh backdrop against my furniture." "We've only been in this home for 12 months, and there is still more I want to conquer. The look will probably still continue to evolve, as I thrive on challenges and projects!" Jennifer also wanted to give a special thanks to Layla at the Lettered Cottage! I agree, her house was such a treat to look at, I keep going back to look in case I missed something!!! I love her style!! Beautiful white kitchen! Thanks for the lovely photos! Love the interview! It is so nice getting to hear what the designers/decorators are actually after. She did such a gorgeous job. Gorgeous home. Thanks for sharing! I love it all! Please share with us the name of that wall color! Her home is so beautiful!! She sure has the talent and the know how. I love everyting she did. But you know you also have the talent and the know how!! I can't wait to see your living area done!!! 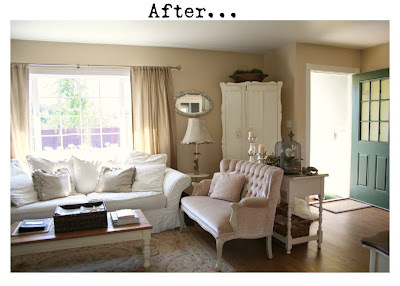 What a treat to read more about this beautiful transformation. Thanks for sharing it once again..
Lovely interview...I saw Jennifer's transformation of her home and it is nothing short of amazing! I am hooked on her website and have been going back and finding so much to do, thanks for sharing that with your followers! Also love her favorite store Pom Pom...wow that is worth a trip to L.A. wanna go with me, we could do some real damage! What would be your suggestion for painting a kitchen that has been wallpapered and the top layer of paper comes off, but leaves a layer of paper on the sheetrock? Thanks! I love this story! Love what's been done to this house! Amazing, what was done with the fridge, I can wait to try it on mine, but in red to set in my laundry-room with my red LG washer/dryer!! This house is total eye candy, I have spent hours looking at it!Wow, wow!! I want to go there and have tea, it what I am thinking! Thanks for sharing! 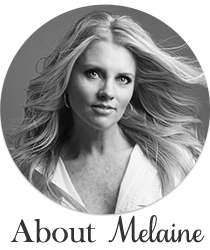 Melaine, thank you for interviewing me for this post. I can't begin to tell you what an honor it is to be mentioned on your blog. Oh, and for one of your readers, my wall color is Ralph Lauren's Canvas Natural. Just came over from Jennifer's blog to take a look. Good to meet you, Melaine. Jennifer's home is beautiful, I love her taste. I think one of the very best things is Jennifer and Adam are doing this themselves and giving the rest of us a lot of inspiration while they move along with the re-do of their home. Also, Jennifer's heart is as beautiful as her home (just a little added plus in my opinion).